The first commercial wine under the Hollick label, the Cabernet Sauvignon, was released in 1983. Successful vintages followed, with wines across the Hollick range winning numerous trophies and medals at National Wine Shows, including the 1985 Jimmy Watson Trophy. Consistently producing exemplary fruit, much of its production is generally earmarked for inclusion in the Ravenswood and Neilson's Block Merlot wines. Extensive canopy renovation of the original 1975 Cabernet Sauvignon plantings was commenced in 2002. A historic cottage, which was restored by Ian and Wendy in 1983 is a feature of the entrance to the winery. Heritage listed and built in 1860, it was the birthplace of famous lyric poet John Shaw Neilson and was the original cellar door. This 12 hectare vineyard was one of the original John Riddoch selections in Coonawarra and prior to the commencement of planting in 1975 was a dairy farm. The vineyard is largely planted to Cabernet Sauvignon and Merlot, with a small area planted to Pinot Noir. The 80 plus hectare Wilgha property was purchased by Ian and Wendy in 1987. The property featured established, dry grown Cabernet Sauvignon and Shiraz vineyards with the Shiraz today forming the backbone of the Wilgha Shiraz. The vineyard was developed steadily with the bulk of the planting occurring in 1993 and 1994. The total area under vine is 45 hectares today. This vineyard also features the Italian Block where varieties such as Sangiovese, Barbera and Nebbiolo have been trialled for their suitability in Coonawarra. The Red Ridge vineyard is located near the town of Naracoorte in the GI of Wrattonbully, which is approximately 50kms north of the Coonawarra winery. The vineyard features similar soils to Coonawarra with shallow Terra Rossa over limestone. The climate is marginally warmer than Coonawarra, facilitating grapes to ripen on average 2 weeks earlier. Ian was adamant that the climate at Red Ridge would be ideally suited to Shiraz, and with this belief planted 20 hectares of this variety in 1998. In 2000 a further 4 hectares of Cabernet Sauvignon and a hectare each of Tempranillo and Sangiovese were planted. 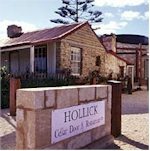 Hollick welcomes visitors to its cellar door facility. The historic building, constructed in the 1870's from local stone and timber slabs was once the home of Australian lyric poet, John Shaw Neilson. The Upstairs at Hollick winery restaurant, was the first winery restaurant in the Coonawarra. Upstairs at Hollick is part of a development at Hollick Wines that includes new bottled wine storage and extensions to the barrel cellar. The restaurant features floor to ceiling windows that ensure uninterrupted views over the Hollick Neilson's Block vineyard and beyond to the broader Coonawarra region. Diners also enjoy views into the barrel store where they may catch a glimpse of the winemaker plying his craft.